Updated to Version 13 on 24/07/2018. 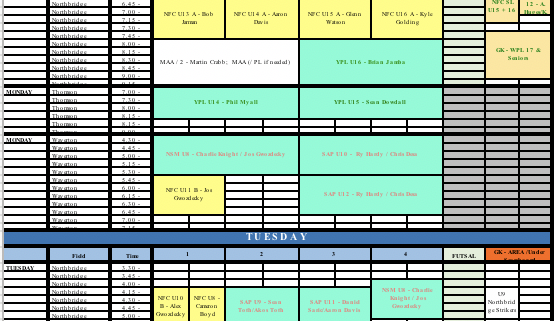 The update include Circuit Training schedule and few new training slots by request. Check carefully and let us know if any issues. Please keep in mind this is a work in progress and changes may happen. Team managers to contact their Age Coordinator or Matilde Johns on academy@northbridgefc.com.au if they have queries or comments. In case of wet weather, grass fields may be closed and training will have to be cancelled. Check this website and our Facebook page for updates. Willoughby City Council’s Grounds Closures page is usually updated around 2pm on any given day. Club Coaches have been allocated and training commenced. Teams will be invoiced during the month of May. Friday 3.40-4.20pm and 4.20-5.00pm at Castle Cove Oval. Check the schedule for openings and email academy@northbridgefc.com.au if your team would like to join. Circuit Training is run by a Club Coach with assistance of a parent from each team participating. Teams are guided through a series of age appropriate drills and exercises. All players should bring their own ball to Circuit Training. The session usually finishes with small sided games. Circuit Training is primarily aimed at U6, U7 and U8 teams. Circuit Training is free of charge. Please note that Circuit Training is not be available on all days at all ovals, so teams may have to change venue to participate. 1. Some grounds are congested. Fields are generally laid out in half field, quarter field or eighth fields depending on number of teams training. 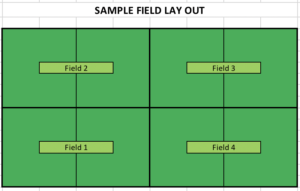 Refer to this basic sample field layout below. At Northbridge Oval, this is as seen from the Pavilion. 2. We especially ask that parents and spectators do not encroach on actual training space. Please keep a safe distance and, for safety, please keep babies, toddlers and young children away from ongoing training. If moving from one side of a training field to another, always walk around the full field, not through fields where training is on-going. This is for your safety, but also to avoid interrupting a session. 3. Player safety is an imperative. Older teams should locate away from younger teams. Coaches should use common sense at all times in this respect. 4. Please keep to your allocated time slot. 5. The schedule has been put together in accordance with the Willoughby City Council Northbridge Oval usage agreement. Please contact Matilde Johns – academy@northbridgefc.com.au – with any queries/comments/change requests or if you think your team is missing.